Our hotel in Córdoba had a rack of brochures for various attractions in the area. 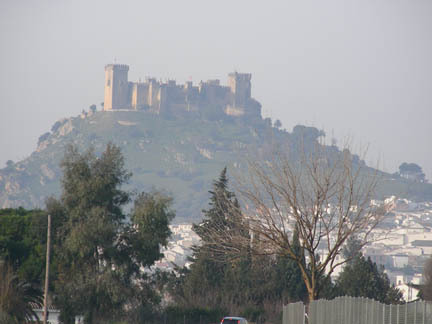 One of them was for this 14th C. castle in the nearby town of Almodóvar del Río. 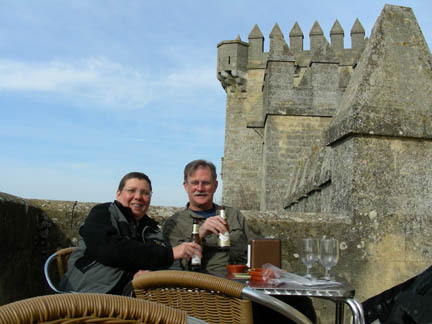 It sits on a rocky knob that rises beside the Guadalquivir River in a wide fertile plain. There is evidence that the Iberian people had a fort here in the 1st C. The Moors built a fort here during their reign but it was conquered by King Fernando III in 1240. 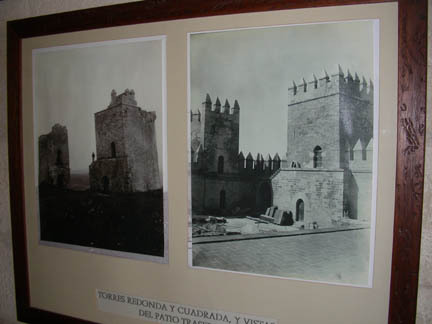 The current fortress was built in the 14th C. and was sold (complete with the village and its people) by King Phillip IV to Don Francisco Corral y Guzmán, an ancestor of the current owners, in order to finance his government. 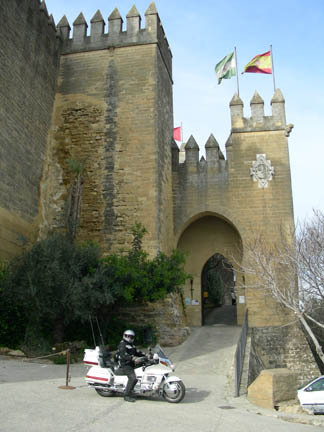 From then on the castle decayed until 1900 when its current owner, the Count of Torralva, decided to rebuild it. Eight hundred villagers worked for 36 years to rebuild it to its 14th C. glory. 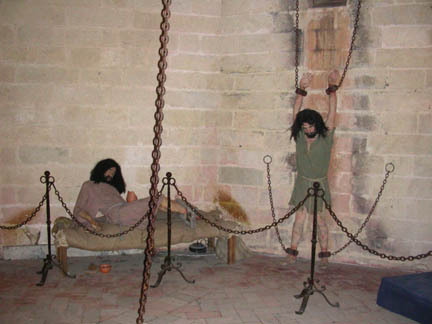 Inside the castle are several displays of life in the 14th C. using manikins and reproductions of the clothing, tools and weaponry of the time. 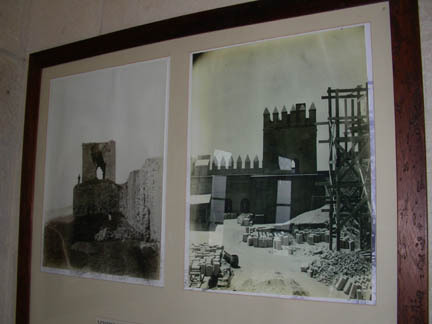 Also is a display of pictures taken in 1901 as reconstruction started and again in 1921 as work was progressing. What they started with and what they created is impressive. The castle is true to its 14th C. plan with the exception of the large permanent tent in the main courtyard. They serve traditional 14th C. meals in it. The pictures of the reconstruction picture are at an angle to prevent the camera flash from reflecting off the glass. As you can see they did a lot of work to convert those ruins into a livable castle. Today the castle has electricity and running water, restrooms, a restaurant and a tavern. It also has life size displays of castle life. A knight gives homage to his lord in which he promises to help defend the king, if needed, in exchange for land and peasants he can rule. Then there is the dungeon with its residents. Below this room was another with the only access through a 3' diameter hole in the middle of this room's floor, and it was a 20' drop to the floor of that room. No way out without help from above. 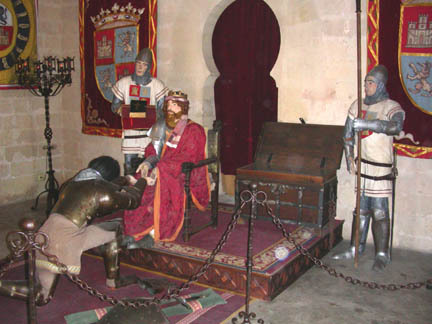 In 1360 King Pedro I lived here and imprisoned several people including the Duke of Benevente who died in the room below. I guess the Duke's homage wasn't acceptable to the king. After lunch in the tavern we headed homeward, its only a couple of hours to home. On the way home we decide to ride through the town of Écija, its biggest claim to fame is as la sartenilla de Andalucía. This translates as "the frying pan of Andalucía". It was right on the direct route home but we didn't stop although it was one of the warmest places on our trip, over 60 F. Now we can say we have been in the frying pan! I just hope we stay out of the fire!! Bad news next. We did encounter Fire!